Thanks to the high concentration of local textile companies, particularly dye-houses for wool, silk, viscose, etc., OBEM and MAIBO, in co-operation with the technicians of their customers, developed a whole range of dyeing machines in rope for delicate fabrics. These dyeing machines have been realized considering as main purpose the high quality necessary for producing precious fabrics having high value. The MAIBO available types OF/PA, OF/PA-TD, allow to dye, in optimal way, fabrics composed of 100% wool, 100% silk, 100% cashmere and also 100% vicuña. 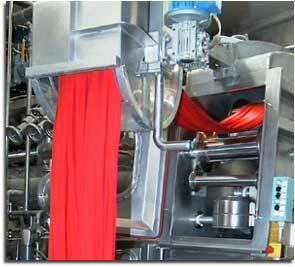 The HT versions OF/PSAT are used especially for blended fabrics: polyester/wool, polyester/cotton, polyester/viscose. The MAIBO production range for pieces dyeing is completed by various sampling apparatuses, having the same characteristics of the MAIBO production machines. The MAIBO company is located in Vallemosso (BI) and is working in partnership with OBEM.